Libya was an Italian colony and became an independent kingdom in 1951. The Libyan Arab Republic was established in 1969, and "People's Socialist..." was added to its name in 1977. 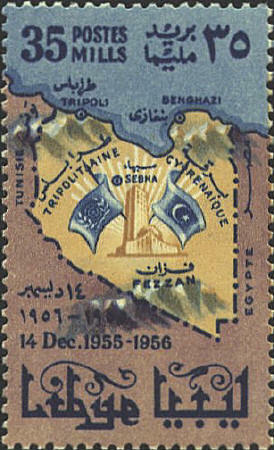 To celebrate her admission to the United Nations Libya issued two map stamps. The design of both is the same. Only one is shown.